“We sought bail for her after she was taken to the court. But our prayer was rejected,” her lawyer Liakat Hossain said. Last August, renowned Bangladeshi photographer and activist Shahidul Alam was jailed for “spreading false information” during mass demonstrations. Prime Minister Sheikh Hasina – who last December secured her third consecutive term in office – has so far made no public comment on the issue. 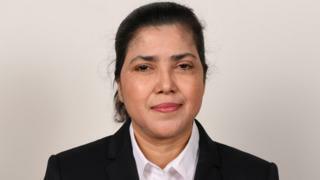 In 2017, Ms Kiron was elected Fifa’s female representative for Asian football. She was soon facing strong criticism for struggling to name the current women’s world champions – the US team. Asked by BBC World Service who won the 2015 Women’s World Cup, she replied “Korea? Japan?” – only giving the correct answer at the third attempt.